Despite the good intentions by Tanzania to block Independent Petroleum Group (IPG) from ferrying contaminated oil from Iran, the Zambian government has pressed the Tanzanian authorities to release the dirty, illegal and substandard oil for the Zambian market. The docking and eventual offloading has been allowed and that offloading for pumping to Zambia will begin on 12 March 2016, according to sources close to State House. “Outgoing President Edgar Lungu personally intervened for fear of losing elections in case of fuel shortages but he does not care about the massive damage the oil will do to the country’s oil refinery, Ndola and the entire energy sector such as motor vehicles, and other machinery that use oils and fuels,” sources revealed. A few days ago, we reported that the Zambian government and Independent Petroleum Group (IPG) of Kuwait loaded illegal and dirty crude oil possibly from the black market in Iran using forged documents then tried to mislead the world that the oil was legitimately purchased from the Emirates. Now the same tanker carrying the dirty and illegal oil has reportedly been detained in Zanzibar, Tanzania as the shippers were trying to smuggle the dirty oil into Zambia. 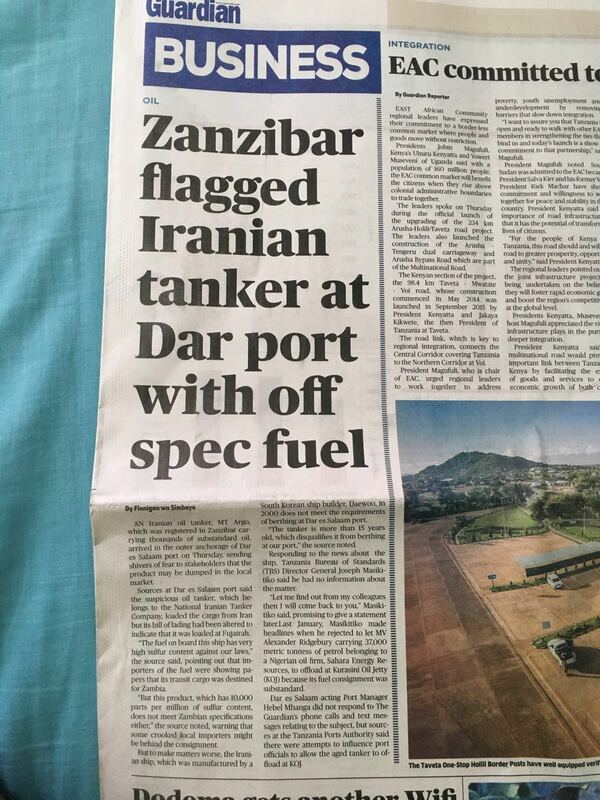 According to Tanzania’s biggest newspaper the Guardian, an Iranian oil tanker, MT Argo carrying thousands of substandard oil, arrived in the outer anchorage of Dar es Salaam port on Thursday, sending shivers of fear to stakeholders that the product may be dumped in the local market. The fuel on board this ship has very high sulphur content against our laws,’ the source said, pointing out that importers of the fuel were showing papers that its transit cargo was destined for Zambia. ‘’But this product, which has 10,000 parts per million of sulphur content, does not meet Zambian specifications either,’’ the source noted, warning that some crooked local importers might be behind the consignment. But to make matters worse, the Iranian ship, which was manufactured by a South Korean ship builder, Daewoo, in 2000 does not meet the requirements of berthing at Dar es Salaam port. The tanker is more than 15 years old, which disqualifies it from berthing at our port,’’ the source noted. Last week, the Zambian Watchdog reported that Independent Petroleum Group (IPG) loaded Iranian Crude oil from Iran and disguised the criminality by issuing fraudulent documents to portray that the Cargo loaded is from Fujaira United Arab Emirates (UAE). The trail clearly shows that the vessel loaded Iranian Heavy Crude Oil from Kharg Island in Iran from National Iranian Oil Company known as NIOC in the trading circles. The Certificate of Qualities are clear on this including the destination of the cargo. Diesel was loaded from Bandar Mahshahr Port of Iran and the quality is 1% Sulfur (against Zambian grade of 0.5% Sulfur). Certificate of Quality which we have clearly indicate that the cargoes loaded in Iran and the product is off spec on the key parameter of Sulfur. It is clear that IPG knew what they were doing and that is why documents were hastily changed to show the vessel known as Mt Argo loaded from Fujaira in UAE. How would the vessel that was in Iran between 10 -11th February 2016 at the same time be in Fujaira as shown by the trail of documentation haphazardly put together? Interesting to note that the BL dates on the new issued BLs are the same as the Iranian ones, making it obvious that the BLs are fake. Also, crude oil cargo description on the new issued BL is only HEAVY CRUDE OIL. It would be surprising that the Zambian agree to open an LC on this – since when did Zambia start ordering heavy crude oil? The Gasoil was loaded from BANDAR MAHSHAHR – IRAN on February 10th 2016 while the Crude oil was loaded from KHARG ISLAND – IRAN on February 11th 2016 as per available certificates of quantity and quality. And who owns the vessel Mt. Argo? Available documentation clearly shows that Mt. Argo is an Iranian owned and registered vessel, owned by National Iranian Tanker Company (http://www.nitc.co.ir/). It is obvious the ship, MT Argo cannot have been loading at Kharg Island-Iran and Bandar Mahshahr port between 10-11th February 2016 and at the same time it was loading at Fujaira UAE.. Unfortunately, they forgot and indicated the product is destined to Zambia! Since when did UAE start producing and marketing Iranian Heavy Crude Oil? The audacity of the supplier is proof of how Zambia is taken for granted due to greed of our politicians working with crooks instead of awarding contracts through competitive bidding. Recently, the Zambian government cancelled a duly signed an ongoing contract with with Gunvor for the supply of oil. The Zambian government claimed that its cancelled the contract because Gunvor supplied contaminated oil. But now the new oil supplier is transporting illegal, substandard and dirty oil.